Objective: In the beginning of laparoscopic surgery, the presence of peritonitis was an absolute contraindication , actually there is controversy about this procedure in patients with peritonitis. We present our expierence in the management of this patology in the Hospital Español de Mèxico( Private General Hospital). Patients and Methods: In a term of five years (2005-2009) we treatred 73 patients with acute abdomen diagnosis and peritonitis. Thirty one (31) were men and fourty two (42) women, with an average age of 58.4 years (28-83), forty six (63%) of the patients presnted comorbilities ( Hipertension and diabetes mellitus) and fifteen (15) had abdominal surgery before. Pritonitis in this patients was caused by: apendicitis in 52 cases, diveticulitis in 13 and perforated ulcers in 8. Laparoscopic surgery was contraindicated in patients with hemodynamic instability or coagulopathy. Tecnique: The patology was surgically (laparoscopic) corrected ( Apendicectomy with Pouchet tecnique, Hartmann’s procedure and primary closure with epiploic patch. ), we washed abdominal cavity with 10 liters of physiologic solution and afterwards we placed Jackson-Pratt (closed) drains. All the patients were treated with antibiotics and general anesthesia. Results: The average surgical time was of 148 minutes ( 60-220). One conversion was made because of technical difficulties. Post operetory ilium was of 2.7 days (1.5). The average of hospital stay was of six days. Twelve patients complicated: two residual abscess, three post operatory fever, two atelectasias, one intestinal obstruction, two ports abscess, one with sepsis, and one muliple organ failure. Two pateints were reoperated. An 82 year patient died with multple organic failure. 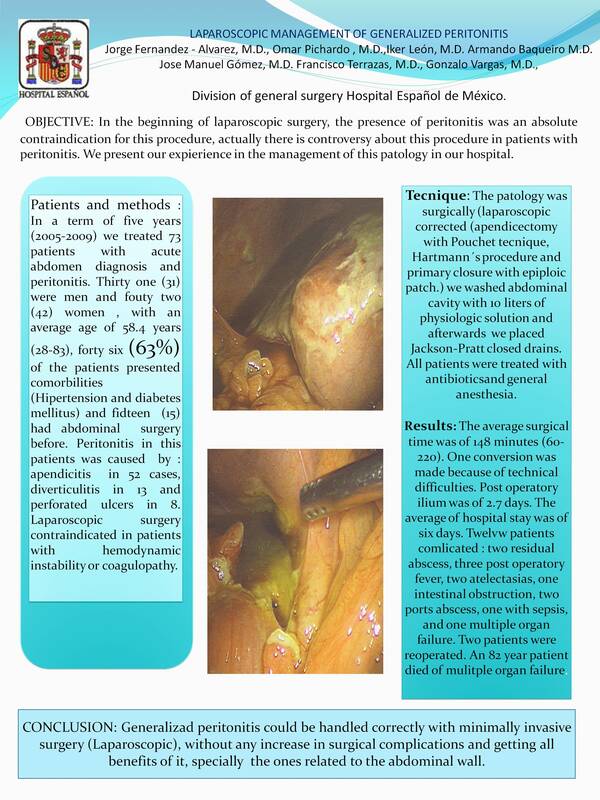 Conclusion: Generalized peritonitis could be handled correctly with minimally invasive surgery (Laparoscopic), without any increase in surgical complications and getting all benefits of it, specially the ones related to the abdominal wall.